Rafael Benitez's agent on Wednesday night refused to discuss reports the Spaniard is set to leave Liverpool. Benitez experienced a dismal 2009/10 season as his team finished only seventh in the Premier League and suffered early exits from the Champions League, FA Cup and Carling Cup. According to several reports, Liverpool have made Benitez an offer to walk away from the club, however there has been no official confirmation. Agent Manuel Garcia Quilon said: "We don't know anything more than what's being said. 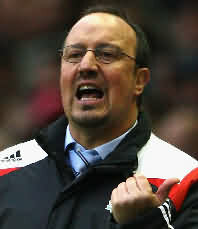 Benitez, 50, signed a five-year contract in March 2009. He joined Liverpool in 2004 after a successful spell with Valencia and led the club to Champions League victory in his first season, however the Premier League title has been elusive and Benitez's team were unable to build on a second-placed finish in the 2008/09 season. The former Valencia manager has recently been linked with the vacancy at Inter Milan, following Jose Mourinho's move to Real Madrid. Liverpool manager Rafael Benitez is on the verge of leaving the club, BBC Sport understands. Benitez will be offered a multi-million pound severance deal to quit Anfield and could depart by the weekend. The Spaniard, 50, signed a five-year contract in March 2009, but failed to deliver success last season as the club missed out on a Champions League place. The American pair's ownership of the Reds has drawn protests from Liverpool fans, who are unhappy with the way the club is being run. Now news of Benitez's impending departure will inevitably lead to question marks over the futures of several key players. Captain Steven Gerrard, star forward Fernando Torres and Argentina midfielder Javier Mascherano have all recently being linked with summer moves elsewhere. BBC sports news correspondent Dan Roan said Benitez was "certain to leave" Liverpool. "The board are in discussions with the manager about him leaving immediately," said Roan. "A severance deal has been offered to Benitez and it is worth significantly more than the £3m that has been reported - he is entitled to £16m as a result of the contract he signed last year. "Benitez is currently on holiday but if he decides to accept their offer he could be out by the weekend." Benitez's agent, Manuel Garcia Quilon, said he would be speaking to the former Valencia boss on Thursday, adding: "We don't know anything more than what's being said. We're not saying anything." Benitez has been linked to Italian giants Inter Milan, who are looking for a coach following Jose Mourinho's move to Real Madrid. Liverpool have refused to comment on the future of their manager. "The club are concerned that details being leaked out could undermine the severance deal," added Roan. "Significantly, no replacement has so far been approached, but that process is sure to begin shortly." Academy director Kenny Dalglish, who won three league titles as manager at Anfield between 1985 and 1991, is believed to have been lined up as an interim replacement. Fulham manager Roy Hodgson and Aston Villa boss Martin O'Neill have been mentioned as potential targets to take over in the long-term. Benitez replaced Gerard Houllier at Anfield in June 2004 and enjoyed a successful start to his tenure as Liverpool won the Champions League the following season. But they could only finish seventh in the Premier League last term despite finishing as runners-up to Manchester United the previous season. As well as the Champions League triumph, Benitez also steered Liverpool to the European Super Cup in 2005 and the FA Cup in 2006. But the inconsistency of last season, where they lost 11 times in the league and exited the Champions League in the group stages, seems to have been a turning point. Benitez had suggested he would require in excess of £50m to put the club back in contention for Champions League qualification, let alone the Premier League title, while co-owner Hicks recently said the Spaniard would have a "substantial" transfer budget this summer. However, Benitez looks destined to leave, despite telling the Liverpool Echo recently that he wanted to stay at Anfield "for a long time". Rafael Benitez has defended his record since taking over as Liverpool boss, insisting that his side have progressed rather than fallen behind. Benitez has been consistently linked with a move away from Merseyside, with Inter Milan reportedly lining him up as a replacement for his old rival Jose Mourinho, who looks likely to join Real Madrid this summer. The 50-year-old Spaniard took charge at Anfield in 2004, winning the UEFA Champions League in his first season and the FA Cup one year later in what appeared to be the dawn of a successful era for the Reds. However despite reaching another Champions League final in 2007 and coming close to winning the Premier League last season, this campaign Liverpool endured a miserable time, finishing seventh in the league and failing to qualify for Europe's premier competition. "There is this legend that Liverpool hasn't won many trophies, that we have failed in that aspect," Benitez told the Daily Mirror. "Well, Chelsea and Manchester United have won 10 trophies in the six years I've been in Liverpool; Arsenal, Spurs and Portsmouth one. "Liverpool? Four trophies and we have played in three finals. Liverpool have been competitive. "Does Liverpool have to win the league, as everybody demands, every year?" The former Valencia boss also went on to state how his spending and dealing in the transfer market could not compare with the expenditure of United and Chelsea, who have been by far the most successful clubs in England since he took charge. "Does the manager have absolute power in England?" he questioned. "Look at the wages picked up by the players on Chelsea or Manchester United's substitutes' bench: (John) Obi Mikel, (Michael) Owen, (Salomon) Kalou, (Dimitar) Berbatov, (Michael) Carrick could be on £4million a year! One of the main criticisms levelled at Benitez has been that he has had money to spend in the transfer market, however he countered this assumption stating that he had made money for the club rather than wasted it. "Some people say I have spent £280million," he added. "But we have spent £220million on players and generated £160million in player sales. That is the equivalent of a £60million net spend over six years: in other words, £10million spent per year. "Deduct from that figure the £120million revenue from the Champions League success and qualification over that period, and we have in fact generated an additional £60million benefits for the club." Rafael Benitez admits the pressure as Liverpool manager will only ease once he wins the championship. Benitez’s Anfield tenure has attracted increasing criticism the longer he fails to end a title drought that stretches back to 1990. Having secured runners-up spot 12 months ago, Liverpool last week concluded a hugely disappointing campaign in which they finished seventh, their lowest final Premier League placing in more than a decade. Despite speculation linking him with an imminent departure, Benitez is keen to stay at Anfield and is awaiting a third meeting with chairman Martin Broughton to discuss the future direction of the club. But the Spaniard concedes he will remain under intense scrutiny until he claims Liverpool’s 19th championship crown. “It is impossible to ignore the pressure (of being a manager) until you have won the league title,” said Benitez. “You know you have a responsibility, there are demands on you and you have to get used to it. Every week you have to pass a test. “As a manager you have to try to be respectful, correct, sometimes positive, other times not so much. Benitez continues to plan for the new season, having already secured the signature of Charlton Athletic teenager Jonjo Shelvey and closing in on a deal for highly-rated young Glasgow Rangers centre-back Danny Wilson. A free transfer move for Standard Liege striker Milan Jovanovic remains in the offing, although the Liverpool manager admits activity has been hampered by the forthcoming World Cup. Rafa today promised Benitez Liverpool will continue to pursue a “Best of British” transfer policy whenever possible this summer as they begin the task of rebuilding. The Reds swooped to sign hot prospect Jonjo Shelvey – who has played for England at a number of youth levels – last month from Charlton Athletic in a £1.7m deal. They are also close to wrapping up an move for Glasgow Rangers defender Danny Wilson, a move that looks all the more shrewd after he was named Scotland’s Young Player of the Year. In the past, Benitez has been criticised for favouring the foreign transfer market and not giving home-grown players the opportunity to show they are good enough to play for Liverpool. Benitez, however, has defended his policy and has made it clear he would be happy to chase deals for English players – as long as the right option comes along. “It is something that we have always tried to do,” he said. “We tried to sign Gareth Barry, we did the same with (Glen) Johnson. That was always the idea. “We have tried to bring in British players with the right mentality and the passion for the club. “We want them to know what it means to play for Liverpool Football Club. Benitez, meanwhile, has not lost faith in Liverpool’s squad and is confident they will show their true colours next season. A goalless draw at Hull just about summed up the Reds’ campaign as they missed an opportunity to capitalise on Aston Villa’s defeat to Blackburn and move up a place in the Barclays Premier League table. The resulting seventh spot represented Liverpool’s worst league performance since 1999. Although Benitez has been linked with Juventus and now Inter Milan the prospects of him leaving Anfield seem to be more remote than they were a couple of months ago. The Spaniard stressed in his post-match press conference at the KC Stadium that he was inclined to stay if the club were able to meet certain conditions. If Liverpool wanted to sack their manager, who has four years remaining on a lucrative contract signed only 14 months ago, it would most likely cost them somewhere between £12m and £16m (€14m and €18.6m). And with their current financial difficulties – figures relating to last season published a few days ago showed the debt of Liverpool’s parent company Kop Holdings had risen to £351m (€408m) – that would be a major undertaking. Benitez is set to meet chairman Martin Broughton, appointed last month by co-owners Tom Hicks and George Gillett to oversee the sale of the club, for a second time this week. It is anticipated the pair will try to find some common ground on how to take the club forward, which the manager appears keen to do providing further barriers are not put in his way. “For any manager, when you have a bad season, you want to improve and change things and I think it has to be this way,” said Benitez, who has now gone four years without a trophy having won the Champions League and the FA Cup in his first two years in charge. “I think all the managers, especially when they are in England and are at a club for a long time, will have good moments and bad moments. The mention of ’senior sources’ is in reference to Benitez’s belief that a campaign is being waged against him in the media. In his post-match comments he used the phrase half a dozen times in relation to reports which claimed he was prepared to sell captain Steven Gerrard and striker Fernando Torres – a suggestion he dismissed out of hand. But until he can come up with an agreeable plan for the future with Broughton nothing can be seen as definite. “Every meeting helps, in one way or another, and at this moment we have to talk about everything,” said the Reds boss. “Hopefully the second meeting will be as positive as the first one...but the press continue with the same agenda. “I think for the stability of the club it is important because we have to move forward on everything. Liverpool chairman Martin Broughton has promised supporters that neither Steven Gerrard or Fernando Torres will be sold to service the club’s debt. There have been fears for many months that Liverpool’s financial plight under the current ownership of Tom Hicks and George Gillett would mean a top name would have to be sacrificed to meet loan repayments. With Christian Purslow having failed to find investment since he was made managing director, Hicks and Gillett appointed Broughton and Barclays Capital to unearth an investor who would be willing to buy Liverpool in its entirety. Still, however, there are worries that Torres and/or Gerrard could go after what has been a hugely disappointing season. “There’s absolutely no reason to sell either Torres or Gerrard,” said Broughton. “I don’t want to sell either of them; Rafa doesn’t want to sell either of them. “The club is not looking to sell either of those. We don’t need to do it to pay off any debt. I can understand their concern. Broughton and Purslow met Rafa Benitez in London on Thursday for a “full and frank” discussion about Liverpool’s future that the chairman said was “helpful”. With Liverpool not scheduling their usual Friday press conference yesterday ahead of the final game of the season at Hull, Benitez has yet to speak publicly on the meeting. Broughton, however, has revealed that he has talked to Benitez about squad strengthening and potential targets. “What I have asked from Rafa is what I think any football club board would ask at the end of the season is an appraisal of each of the players,” said Broughton. This newspaper had its issues with Gerard Houllier. A control freak, supremely sensitive to even the mildest of criticism – and a man who refused to countenance any suggestion that he might have got anything wrong . . . ever. Yet when it came to the crunch, Gerard Houllier accepted that no individual was bigger than Liverpool Football Club. He relinquished his management of the club graciously, with enormous dignity and in a manner which reflected well on all parties. He even posed for pictures on the Anfield pitch. It’s a lesson in humility the current Liverpool manager would do well to heed. I’m a supporter of Benitez. I believe his departure would harm Liverpool Football Club. I certainly want him to stay. But at the moment he’s playing Liverpool Football Club – and its fans – like a harp. His agent told us on Monday that his client wanted to stay on as Liverpool manager. We are told that Benitez was enjoying a day off. We’re all entitled to a day away from the pressures of the workplace – especially someone working in the insanely pressurised environment of a top Premier League football club. But this is the man who last summer interrupted a family holiday in Sardinia to return my call and get the message out that Barcelona could forget about signing Javier Mascherano. If Rafa has a point to make, he will make it. Which is why the silence, or the cryptic ‘concentrating on the next match messages’ are so disingenuous. All that’s being gained by maintaining a dignified silence is adding fuel to those that believe his “pride” at being courted by Juventus is something more tangible. If Rafael Benitez wants to stay at Liverpool Football Club, why not tell us forcefully, unequivocally and clearly? Then we can turn the spotlight on the men who will make that decision, content that at least one party inside Anfield is still doing things the Liverpool Way. Liverpool have had the first in what they hope will be a series of meetings with manager Rafael Benitez amid speculation he could move to Juventus. Benitez, 50, had reportedly cancelled two meetings with chairman Martin Broughton before they met on Thursday. "The meeting was constructive," said a Liverpool spokesman. "Views were exchanged on issues of concern to both the board and manager which were either addressed or to be picked up in forthcoming meetings." In November he said he was sure of guiding Liverpool to a top-four finish in the Premier League, but last Sunday's 2-0 home defeat by Chelsea ended the chance of that happening. As a result, Liverpool will be without Champions League football next season - the first time since 2002/03. As well as their on-field struggles, Liverpool's season has been overshadowed by continued speculation about the future ownership of the club, which came to a head in April when owners Tom Hicks and George Gillett said they would be looking to sell. Liverpool legend Tommy Smith has labelled the Reds' current campaign as "the season from hell" and pleaded with manager Rafael Benitez to clarify his future at the club. Liverpool are in turmoil both on and off the pitch, having failed to qualify for the Champions League and with uncertainty regarding the Anfield outfit's future ownership. And speculation continues to link Benitez with a move to Juventus at the end of a season that delivered another hard blow with Liverpool's elimination from the Europa League in the semi-finals last week. It has all been too much for Smith, who spoke out in his Liverpool Echo column. "Rafa has always said he loves the club, the fans and the city. For the sake of all three, he must now come out and make his intentions clear - one way or the other," Smith said. "Rafa has said nothing publicly to suggest he is still up for the challenge, ready to try and sort out the problems and go again. That is only adding to the anxiety and fuelling more controversy. "We all know the problems the American ownership has brought - and at times caused the manager. It can't have been easy for him to a degree but in truth he has made mistakes which cannot be blamed on (Tom) Hicks and (George) Gillett. "Not only has this campaign been the season from hell, with 19 defeats, the manager is giving every indication he has had enough and wants out. "One word sums up the whole, sorry state of affairs at Liverpool these days - embarrassing. "Granted, Rafa's bought some really good players - but others seem happy to pull on the red shirt yet have no idea what it means to wear it. "This squad isn't good enough and does not have enough depth to it. That is a crying shame because we've had such a strong spine with players like (Jose) Reina, (Jamie) Carragher, (Javier) Mascherano, (Steven) Gerrard and (Fernando) Torres to have built around." Smith, who made 638 appearances for the club, believes the fans deserve better. He added: "These Liverpool supporters are always there through thick and thin - and right now it is very thin times indeed for them all. "The manager must first come out and make his intentions clear. Then we have to pray that soon the club is sold to owners who have the clout to invest in it and get us back on track. "For the sake of those wonderful fans, I hope they get some good news soon. Because they deserve it." There was a time, not so long ago, when Liverpool supporters used to ask, then discuss, five straightforward questions. They went along the following lines: Who are we playing? When and where is the game? Which players are injured? What are our transfer plans? It was a simple time. Occasionally results would go askew and that would lead to some frustration but, in the main, feelings of angst were always assuaged by the fact the club had firm foundations and were capable of recovery. If only the same could be said now. Pre and post match chatter these days, particularly after Sunday’s harrowing defeat against Chelsea, is consumed by one alarming quandary – why? Why has it come to this? The end of the season from hell, which will finish with Liverpool taking the road to Hull, cannot come quickly enough but when the final whistle sounds at the KC Stadium on Sunday afternoon, it will not signal the termination of all woes. Far from it. Liverpool, as it has been noted on many occasions, is a club on its knees, lacking direction, the rudderless ship sailing into the eye of a storm; each passing day brings about a new, complex set of woes. Take yesterday’s events. After the agenda had been dominated for days of how Rafa Benitez wants to meet new chairman Martin Broughton, a story then appears claiming that Liverpool’s manager had cancelled two appointments. At a time when the club needs everyone pulling in the same direction, to arrest an alarming slide, it is impossible to escape the conclusion that, unless drastic, decisive action is taken, Liverpool are on the verge of falling to a place from where there is no escape. Browse any Liverpool supporters’ forum you wish on the internet and you will see the mood is inescapably dark. Fears are growing that the travails of the past nine months are a worrying sign of things to come. Benitez has made it quite clear that he wants reassurances about Liverpool’s financial climate and, if he is to continue as manager, that is both reasonable and understandable, given what has happened during the past two years. Unable to escape the feeling that his main priority is to juggle the debt saddled upon it by Tom Hicks and George Gillett, many are wondering whether he has reached breaking point after becoming increasingly disillusioned over broken promises. Examine the case of Milan Jovanovic, for starters. Despite having worked hard to convince the Serbian international to join on a Bosman transfer, the pre-contract agreement remains hitherto unsigned. Why? “I decided to sign an extension because the squad was good and the money could be there. At the end, things changed,” Benitez said after Liverpool’s bid to reach the Europa League final was ended by Atletico Madrid. Nor, it would seem, does anyone else. Though Barclays Capital have been drafted in to oversee the sale of Liverpool, Hicks and Gillett – much to the Kop’s increasing chagrin – are not going to riding off into the sunset any time soon. Broughton’s arrival has posed questions over the position of Christian Purslow as managing director; his chief responsibility was to find fresh investment that would lower the level of debt and give Liverpool the scope to start work on building that fabled new home in Stanley Park. Bar one episode with the New York-based Rhone Group in March, as yet the club is no closer to receiving the significant cash injection the squad that is so desperately needed to get Liverpool back on an even keel. Should that not happen, riding off into the sunset could become a theme for the summer; the future for Fernando Torres, for one, is far from certain and any number of clubs would be willing to pounce if he gave an indication that he wants to move. Ditto Steven Gerrard. Both those men are desperate to win football’s major prizes wearing Liver Birds on their chest but do you honestly see Liverpool throwing down a title challenge next season to placate their frustrations of not being in the Champions League? Benitez, whose family is settled on Merseyside, wants money to strengthen his squad but critics – and there are a growing number – will ask whether he can be trusted to spend it, given that his last major acquisitions (Glen Johnson/Alberto Aquilani) have failed to pull up trees. What’s more, club officials have been unimpressed with the way he has flirted with Juventus since revealing his “pride” at the initial link with the Serie A club in January; for many reasons, there are significant tensions in the corridors of power. Yet regardless of that, Manuel Garcia Quilon – Benitez’s agent – said yesterday that his client wants to continue as Liverpool manager and it must be stressed there is no real appetite among senior figures to make that change. So if that is the case, why are the wheels coming off – a point hammered home by the fact they have suffered 19 defeats this season – so spectacularly? Why is the club that made conducting business behind closed doors an art form now showing the world its myriad problems. Perhaps the situation will become clearer after Benitez and Broughton eventually speak and, inevitably, there will be a full and frank exchanging of views – that meeting simply has to find a resolution to problems that have loitered for years. If it doesn’t, the simple, straightforward life that every Liverpudlian craves – you know, the one that sees them talking about a successful football team – will remain a pipedream and the questions, sadly, will only become more difficult. Rafael Benitez's agent claims the Liverpool boss has not received any offers from Juventus or any other club - and wants to stay at Anfield. Speculation over Benitez's future shows no signs of abating, with Manuel Garcia Quilon's comments in the last few weeks having ranged from suggesting Juventus were ready to sign Benitez this summer to the latest proclamation that he has no intention of leaving Anfield. Even Benitez himself may not be entirely sure where his future lies as he waits to hear what chairman Martin Broughton has to say about plans for next season and beyond. Crucial to everything remains any proposed takeover after co-owners Tom Hicks and George Gillett officially put the club up for sale last month, appointing Broughton to oversee the process. Having finally scheduled a meeting with the chairman for this week Benitez will eagerly await the latest update on potential investors and, more importantly, what his likely summer transfer budget will be. Even with the £6million generated from the January sales of Andriy Voronin and Andrea Dossena and money from the expected summer departures of a few first-team fringe players the Liverpool manager will still be looking for a figure around the £40million mark. If there are no indications he is likely to get anything close to that sum Benitez then has a decision to make, although his options have been complicated by the fact that long-time suitors Juventus have, like Liverpool, failed to qualify for the Champions League. And despite their very public courting of Benitez in recent months, Quilon denied the Serie A side had made an official approach. "We have not received any offers from any club," Quilon told Press Association Sport. "Benitez's aim is to remain at Liverpool and try to help the team improve with new owners. "He is under contract and his wish is to remain at Liverpool." Quilon's denial of any interest has not prevented Juve goalkeeper Gianluigi Buffon from praising Benitez's qualities. "Rafa's CV is really good. Tactically he is a very good manager but he has also showed he can deal with problems off the pitch," said the Italy international. "Benitez is a great professional that every team would like to have." If new owners are found, and there is little likelihood of any development on that score before the end of the month, they may decide Benitez's future for him. The former Valencia coach has four years remaining on his long-term contract and would be entitled to around £12million compensation were he to be sacked. Hicks and Gillett are unlikely to sanction such a payment as they are looking to maximise their return having bought the club back in 2007. But a new investor may have their own ideas about who they want to lead the club forward. If Rafael Benitez truly respects Liverpool Football Club he'll leave Anfield today. The players have lost the faith, the boardroom is unimpressed with the politicking and the supporters are suffering, albeit in silence. If Benitez exits quickly, accepting Juventus' generous offer, he goes with some dignity. If he stays, the inevitable long goodbye becomes indescribably messy, distressing for all concerned and demeaning to a club of Liverpool's great history. This is not a warning for Benitez, this is a fact. He's lucky. The Kop's refusal to call for his head, in the wake of a disastrous season and four trophy-less years, speaks handsomely of their substance and loyalty. At any other major club, probably barring Arsenal, restless natives would have been chanting for the manager's removal. Benitez now meets Liverpool's new chairman, Martin Broughton, to discuss transfer budgets but why should the board trust him with the club's cash? His record is too inconsistent. They give him money for a table and he comes back with a lampshade. He's got a centre-back at left-back and a holding midfielder at right-back. Liverpool's squad is an exercise in mismanagement. Over the past six years, Benitez has been provided with £230,476,000, not forgetting a rich bequest in Steven Gerrard and Jamie Carragher, yet his bench against Atletico Madrid last Thursday read: Diego Cavalieri, Sotirios Kyrgiakos, David Ngog, Philipp Degen, Nabil El Zhar, Daniel Ayala and Daniel Pacheco. Their entries in football's Who's Who do not run to many lines. Combined. How embarrassing. This is Liverpool, five-times winners of the European Cup and joint record-holders of 18 league championships, the club of Bill Shankly and Bob Paisley, John Toshack and Kevin Keegan, Kenny Dalglish and Graeme Souness, Robbie Fowler and Michael Owen, yet with largely a bunch of unknowns on the bench. How the mighty are fallen. Benitez's cheerleaders claim his achievements at Anfield are actually remarkable given his restricted budget over the past two seasons. They point to injuries and mention the more alluring wages on offer elsewhere. Good try. Roy Hodgson prospers at Fulham on a fraction of Benitez's resources and none of the annoying scheming. Arsene Wenger spends far less than Benitez and has a far better eye for young talent. Any inspection of Benitez's £230m outlay must highlight successes such as Pepe Reina, Javier Mascherano and Fernando Torres. Not all were guaranteed to do well yet they have grown under Benitez. Even with Lucas, Kyrgiakos, Ryan Babel and Emiliano Insua on the books, Liverpool's squad are valued at around £250m. Yet Liverpool's board could legitimately ask Benitez his views on Hodgson's team-building skills and just who is that leading Fulham out in the Europa League final in Hamburg next week? Why it's Danny Murphy, just the type of strong character and intelligent midfielder Liverpool crave, a popular player shown the door by Benitez in the first of his summer clear-outs/trolley dashes. Murphy or Lucas? Discuss. But not for long. All managers sell players they shouldn't but Benitez has dropped some real clangers. How Liverpool could do with a committed left-back like Stephen Warnock, whose heart was almost broken when let go by Benitez. Warnock, now knocking on England's door, could have spared Liverpool those awkward moments when Andrea Dossena or Insua was at left-back. Dear old Dossena. Recruited for £7m in July 2008, he endured a hapless stay, being humiliated by Leeds United's Robert Snodgrass among others, and was offloaded for £4.3m to Napoli 18 months later. Dossena's fellow recruits in the class of 2008 were Cavalieri, Ngog, Robbie Keane and Albert Riera at a cost of £39m, and none proved worth it. Quantity as much as quality has been Benitez's hallmark in the transfer market. He has brought in 77 players, a tally that prompted Ian St John to remark wryly over the weekend that "maybe Rafa's setting up his own league''. Whatever happened to Benitez's likely lads such as Miki Roque, Krisztian Nemeth, Astrit Ajdarevic, Antonio Barragan, Besian Idriza, Mikel San Jose Dominguez and Antonio Nunez? The haemorrhaging of money on fees, let alone wages, is a concern. Jermaine Pennant arrived for £6.7m and went on a free. Fernando Morientes cost £6.3m and exited for £3m. Keane hardly had time to unpack his bags after his £19m signing before being shipped out for £16m, lacking suitability to the manager's new 4-2-3-1 system. Benitez has been given enough money. He's just not given his buying enough thought. Time to go. If anyone can fix Benitez up with flights to Turin it's Broughton.